Left to right: Sr. Mary Susanna Vasquez, O.P. and Sr. Francis Clare Fischer, O.P. 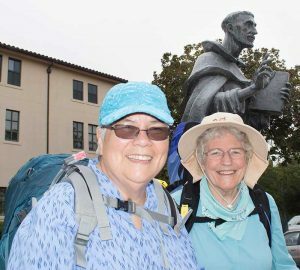 Sisters Francis Clare Fischer and Mary Susanna Vasquez, Dominican Sisters of Mission San Jose, are ready for the adventure of a lifetime! The August 20 pilgrimage walking the Camino de Santiago, Way of Saint James, does not start on foot but with a plane trip to Biarritz, France, and a train to St. Jean-Pied-de-Port on the French side of the Pyrenees. The pilgrimage culminates about 500 miles later in Santiago, Spain. They plan to walk about 12-15 miles a day to resting places of pilgrim hostels along the way. 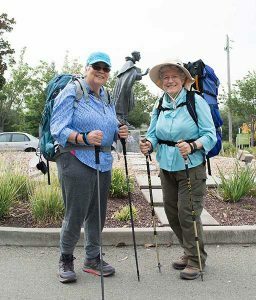 Hiking with their 19 pound backpacks at various regional parks, the hills of San Francisco and our Motherhouse grounds has prepared them physically and emotionally. Journaling and photography will memorialize their unfolding journey and keep us in touch when internet is available. Left to right: Sr. Mary Susanna Vasquez and Sr. Francis Clare Fischer. Sister Francis Clare states: “The Camino is a “Life Gift” of time to be present to the Divine in each person I encounter and in myself. Praying for PEACE as I carry with me all my Sisters, Family and those who have touched my life over these past 71 years…All is Blessing!” S. Francis Clare’s sister-in-law Karen Fischer from Keaau, Hawaii, will also walk with them on this special pilgrimage. Blessings on every step…and to all the pilgrims you meet along the way! Follow their journey at https://www.facebook.com/DominicanSistersofMSJ/ or www.msjdominicans.org.